At random intervals, the browser crashes upon completing load of a page. Complete crash to desktop with Access Violation or SEGSEV. Tried it in Safe-Mode (no plugins), still crashes. Confirmed on Mac, Windows, & Linux. The crash appears to be introduced in 3.5.2. Versions 3.5 and 3.5.1 were tested for 1 hour with no crashes. All others crashed within 2 minutes. Testing consisted of simply reloading http://www.vizworld.com every 30s. Here is my Mac crash on trunk: http://crash-stats.mozilla.com/report/index/e52aa848-8207-492f-8b9c-efc9b2100126. After digging into wordpress I found that the combination of W3 Total Cache & WordPRess.com Stats is to blame. I edited the Wordpress.com Stats plugin to remove the 'Link: <http://wp.me/asdf>; rel=shortlink' HTTP Header it returned, and remove the <link rel="shortlink"> it added in the HEAD block. That seems to have eliminated the crash. Perhaps a conflict in the "X-Powered-By: W3 Total Cache/0.8.5.1" Header and the "Link" header tickled some rare Bug? If I re-enabled the Link header, the crash returns. Had this crash on me twice in the past couple of days, with a Firefox 3.6.4 beta on Mac OS X 10.4 (build ID: 20100513134853). Any progress on getting this fixed? Or any insight as to why it's recently cropped back up? It's crashed twice more since I last commented. (One of the crash reports I linked to earlier was also from this website.) However, one of the crashes is apparently from [@ nsTimerEvent::Run() ], which isn't mentioned in the bug summary. Gordon: I don't crash following your steps using Mozilla/5.0 (Macintosh; U; Intel Mac OS X 10.6; en-US; rv:1.9.2.4) Gecko/20100513 Firefox/3.6.4, but I would have to go down to the lab to try 10.4. The lower volume nsXULControllers::cycleCollection::UnmarkPurple.nsISupports.. crash seems to have strangely disappeared or shifted in 3.6.10.
and nsXULPDGlobalObject::cycleCollection::UnmarkPurple.nsISupports.. is only seen on older 3.5.x releases in small volume. looks like at this point this is mostly about nsJSArgArray::cycleCollection::UnmarkPurple.nsISupports.. This error seems to cause the majority of my crashes on Firefox—which have reached 11 per day at the top end now. To Randall Hand above, there may be a link with Wordpress Stats, because I use this plug-in, though I don't use the W3 Total Cache. Noting that I have this same crash on Windows Vista (I typically get it on XP, from which I filed the comment above). It is far more widespread than I believe Mozilla would like to acknowledge. > Mozilla would like to acknowledge. Mozilla doesn't take the time to actively not acknowledge something. If it were more "widespread", there would be more than 10 comments here. Comment 8 shows the crash stats as of the end of September. If you have seen a sharp increase of crashes in recent builds, please provide your crash IDs. I would have filed more, but they have disappeared from my about:crashes. On the 9th, for example, I had 11 crashes (http://jackyan.com/blog/2010/1209b4.png). Now it shows only seven. Typically, Firefox crashes four times per day, more often than not with this crash, regardless of the platform I use (XP or Vista). Unlike others, I have seen a sharp increase in crashes since 3.6.10 (no crashes per day to an average of four), but never knew about Bugzilla or about:crashes till fairly recently. I realize everything is relative, and you’ve seen other things that crash Firefox a lot more, but there’s a strong possibility that many netizens don’t even know about this site. Again, there were far more on the day (e.g. about:crashes shows three from yesterday; in fact there were five—I hope this means they are either getting solved or consolidated), but these are the only two remaining for 3.6.13 (the last for 3.6.12). Hmm... you're right. In the past week, there have been over 3600 crashes of this sort in 3.6.13 on Windows. In the past month, ~4900. It does appear that there is a significant difference between build 2010113000 and build 2010120300, in terms of the number of crashes, though that may be a result of the disparity between number of users of those builds. 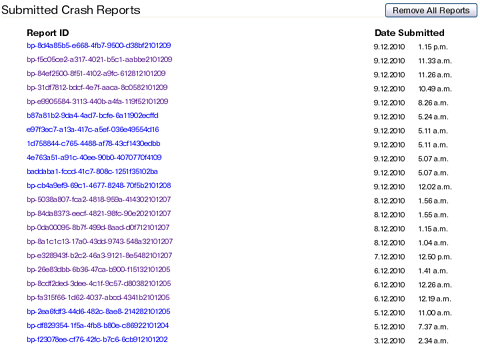 Interestingly, there is a large number of crashes for 3.5.15, and significantly smaller for 3.5.16. I'm not the right person to be looking into this, but that should help whoever is. Thank you, Gordon—it’s nice to have confirmation of the error, especially from someone who knows more than the average punter. Do you think I should keep filing here as the crashes recur or will this be annoying for everyone? Jack: you're using mcafee antivirus? could you please try using MSE2 and see if it complains? I will attach frozen.dll as soon as I figure out how to do it—thank you for checking it out for me, in advance. Timeless, here is my frozen.dll as requested. Any help would be most welcome. thanks, mse2 doesn't object and there's a digital signature which windows seems to accept as coming from google. Sorry for disappearing. Ryan, thank you, I will download it. > to accept as coming from google. Timeless, thank you. In other words, my frozen.dll is OK? Or is there something afoot with a Google add-on I might have? Quick note: this error no longer seems to creep up with my crashes—figuring it could be a plug-in? Ha ha, spoke too soon! Two crashes in half an hour. The first one was not this, but imgCacheExpirationTracker::NotifyExpired(imgCacheEntry*), which has also been coming up a lot. So these 3 signatures only appear in 3.5 and 3.6. Since they don't happen in current versions, resolving this bug as works for me. There are other bugs logged for similar signatures already.